Gretel Tippett in action against the Silver Ferns during the Quad Series. GRETEL Tippett says nobody ever has a mortgage on an Australian Diamonds dress. But the Firebirds star returns home on Sunday for the opening Test of the Constellation Cup series between Australia and New Zealand to continue building her case to be a regular fixture in the national side. Goal attack Tippett is coming off her best season at club level when she lit up Boondall on a consistent basis to barnstorm her way into the Diamonds squad after being on the fringes of the Australian team for several years. 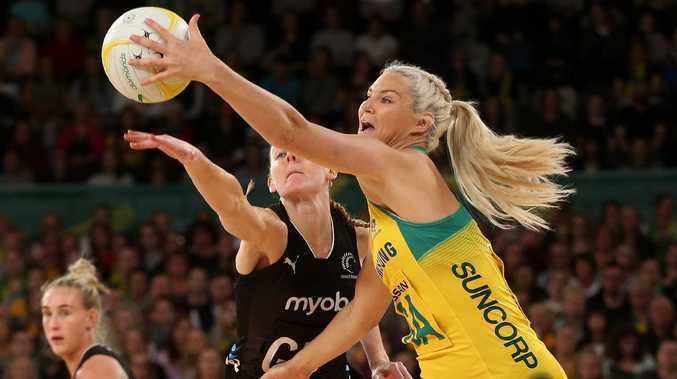 Tippett started the final Quad Series match last month when Australia scored a hard-fought 60-55 win over the Silver Ferns in Melbourne but fellow goal attack Steph Wood has returned to the Diamonds squad after missing the last outing with a thigh injury. Regardless of whether Tippett starts again or comes off the bench as an impact player, she plans to make the most of any chance that comes her way. "It (representing Australia) is an awesome opportunity and one I'm very grateful for,'' Tippett said. "I don't think there's ever a time when you think that position is yours. 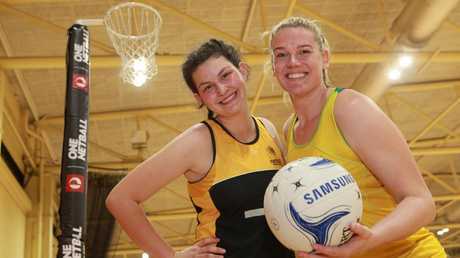 Diamonds player Caitlin Thwaiteswith Tamikia Galgey from the Marie Little Shield Competition at Boondall. "You are always seeking to be better and you are always challenged. "Steph and I, we love training alongside each other but we also know we add something completely different. "Whatever Lisa (Alexander, Diamonds coach) goes with, we are happy with. Tippett hit the winning goal in the 2015 ANZ Championship grand final at the Brisbane Entertainment Centre and is thrilled to be representing her country on her home floor. "I absolutely love it. The Brisbane crowd just adds a whole other level of excitement and belief as well,'' she said. The Diamonds wound-up their preparations at Boondall on Saturday and spent time with players from the Marie Little Shield competition. The finals of the competition for women with an intellectual disability will be the curtain-raiser for the Constellation Cup on Sunday. New Zealand has made three changes to the squad from the recent Quad Series when head coach Noeline Taurua made a positive start to turning around the fortunes of the Silver Ferns. New Zealand captain and returning Sunshine Coast Lightning star Laura Langman will play her 145th Test, equalling the Silver Ferns record held by Irene van Dyk.